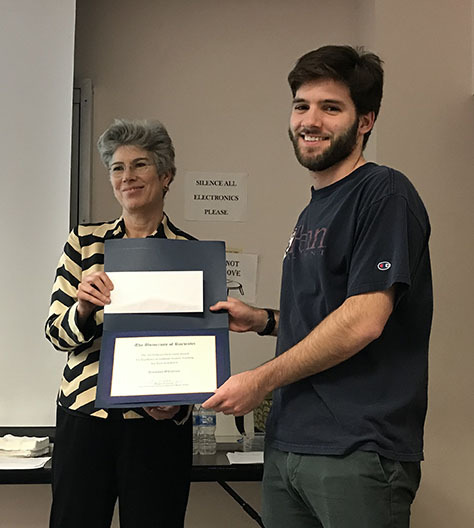 Neuroscience Graduate Program and Medical Scientist Training Program student Brendan Whitelaw has been selected as one of the recipients of the 2019 Edward Peck Curtis Awards for Excellence in Teaching by a Graduate Student. The awards were established to recognize graduate students who advance the teaching mission of the University by providing highly skilled and innovative undergraduate education. Students were nominated by their department chair and a faculty member. Congratulations, Brendan! The Del Monte Institute for Neuroscience brings together faculty across the University of Rochester who are engaged in neuroscience research. You must be a faculty member or postdoctoral fellow at the University of Rochester with an interest in brain science to become a member. Click here to apply. The Ernest J. Del Monte Institute for Neuroscience is pleased to announce the availability of up to 21 pilot project awards (maximum budget of $50,000 per award) to support novel basic, clinical and translational projects in the neurosciences. These awards will be supported under five programs for 2019 and are open to all faculty members across both the Medical School and the Undergraduate Campus. Funds available for this year’s program are $840,000. The application deadline is 5:00 pm on Monday, March 18, 2019. The University of Rochester Medical Center (URMC) has received $8 million from the National Institutes of Health (NIH) to support pioneering research on muscular dystrophy. The grant, which is a renewal of URMC’s Paul D. Wellstone Muscular Dystrophy Cooperative Research Center, will fund ongoing work to investigate the genetic mechanisms and progression of this complex multi-system disease, research that has led scientists to the threshold of potential new therapies for myotonic dystrophy. Congratulations to Neuroscience associate professor Martha J. Gdowski, Ph.D. and Neuroscience Graduate Program alumna Nguyen Mai, Ph.D. for being inducted into Alpha Omega Alpha, the national medical honor society! Election to Alpha Omega Alpha is an honor signifying a lasting commitment to professionalism, leadership, scholarship, research, and community service. A lifelong honor, membership in the society confers recognition for a physician's dedication to the profession and art of healing. On Saturday, February 2, seven high school students competed for the title of Rochester’s Brainiest Teenager. The students came from five schools in the Greater Rochester Area and competed in a grueling day with three rounds of 30 neuroscience questions in front of a panel of University of Rochester researchers. Ania Majewska, Ph.D., Chris Holt, Ph.D., Liz Romanski, Ph.D., Jude Mitchel, Ph.D., and Heather Natola, Ph.D., served as judges for the competition. The quiz-style competition was structured so that each student had the opportunity to answer every question and the student with the highest cumulative score was declared the winner. The competition was won by Emily Han who correctly answered 69 out of 90 questions. Emily will receive a trip to the National Brain Bee in Hershey, Pa. in April, sponsored by the Rochester Society for Neuroscience and the Department of Neuroscience. The National Brain Bee will consist of two days of neuroscience and neurology questions on topics such as patient diagnosis, neuroimaging analysis, pathology, and general brain facts. 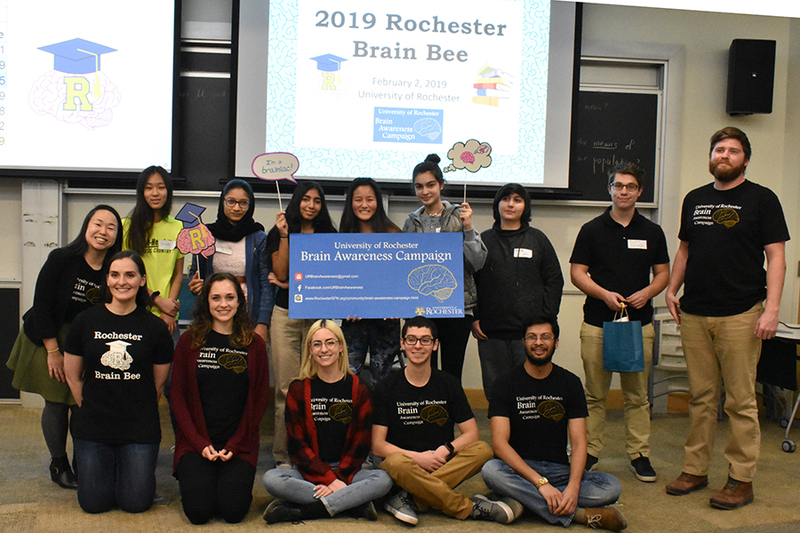 The Brain Bee was organized by the University of Rochester Brain Awareness Campaign Committee as a kick-off to 2019. The Rochester Brain Awareness Campaign was founded in 2013 and continues to offer neuroscience outreach for free to local schools. Since its founding, the team has visited 25 schools and reached 4,000 students with 200 volunteers. It has also had booth exhibits at Rochester Marches for Science, attended a St. John Fisher’s science career day, and have had an official Rochester Girl Scouts badge every year since 2017. The organization is entirely student-run, and is supported by Ania Majewska, Ph.D., and the Rochester Society for Neuroscience. The brain’s system for removing waste is driven primarily by the pulsations of adjoining arteries, University of Rochester neuroscientists and mechanical engineers report in a new study. They also show that changes in the pulsations caused by high blood pressure slow the removal of waste, reducing its efficiency. This might explain the association between high blood pressure and Alzheimer’ disease, the researchers say. Alzheimer’s, the most common cause of dementia among older adults, is characterized by abnormal clumps and tangled bundles of fibers in the brain. The study, reported in Nature Communications, builds upon groundbreaking discoveries about the brain’s waste removal system by Maiken Nedergaard, co-director of the University’s Center for Translational Neuromedicine. Nedergaard and her colleagues were the first to describe how cerebrospinal fluid is pumped into brain tissue and flushes away waste. Subsequent research by her team has shown that this glymphatic waste removal system is more active while we sleep and can be damaged by stroke and trauma. This latest research shows “in much greater depth and much greater precision than before” how the glymphatic system functions in the perivascular spaces that surround arteries in the outer brain membrane, says Douglas Kelley, an assistant professor of mechanical engineering and an expert in fluid dynamics. His lab is collaborating with Nedergaard’s team as part of a $3.2 million National Institute on Aging grant. For this study, Humberto Mestre, a PhD student in Nedergaard’s lab, injected minute particles in the cerebrospinal fluid of mice, and then used two-photon microscopy to create videos showing the particles as they moved through the perivascular spaces. A new study to help understand brain waves in children with autism is underway right now at the University of Rochester Medical Center. Their aim is to foster earlier detection and foster better therapies in the future. Children with autism respond differently when they hear a sound such as music or see an illustration. Honing in the difference in brain waves between autistic children and children who do not have autism, is part of a new study at Del Monte Institute for Neuroscience at URMC. “If you can provide a biological marker that could be reproduced earlier in a child's development, then that therapy can start earlier, the better outlook for that particular child,” said Dr. Evan Myers, Postdoctoral Fellow at the Cognitive Neurophysiology Lab in the University of Rochester Del Monte Institute for Neuroscience. Researchers will place a electroencephalography cap and have kids observe different images on a computer screen. The findings will determine the next step through clinical trials with the goal of diagnosing a child with autism a lot sooner. The National Institute for Mental Health (NIMH) recommends a test, called the Reading the Mind in the Eyes Task (RMET). Here, participants view 36 black and white photographs, originally selected from magazine articles, of solely the eyes of Caucasian female and male actors. Participants then decide which of four adjectives—such as panicked, incredulous, despondent, or interested—best describes the mental state expressed in the eyes (the correct answer has been generated through consensus ratings). But there’s a problem. Using data from more than 40,000 people, a new study published this month in Psychological Medicine concludes that the test is deeply flawed. We are pleased to welcome Dr. Wang to the University of Rochester Medical Center, the Department of Neuroscience and the Del Monte Institute for Neuroscience from the NIH. Dr. Wang comes to us as the former chief of the Unit on Neural Circuits and Adaptive Behaviors at the National Institute of Mental Health. Dr. Wang received his B.A. in Biochemical Sciences from Harvard College and his Ph.D. from the University of California at San Francisco, where he studied the molecular regulators of sensory axon growth and branching during development with Marc Tessier-Lavigne. Dr. Wang obtained postdoctoral training with Susumu Tonegawa at the Massachusetts Institute of Technology, where he examined the ways in which cortical neurons respond to an animal’s experience by directly visualizing the molecular activity of a given set of neurons over several days in the live animal. With this approach, he revealed a physiological function of neural activity regulated gene Arc in sharpening stimulus-specific responses in visual cortex.